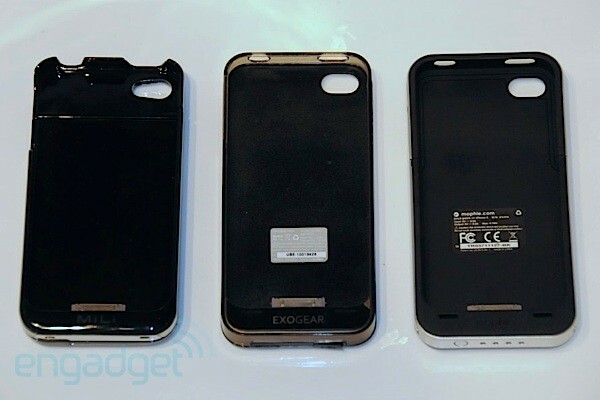 You asked for it now here it is, part two of our iPhone 4 battery case review featuring fan-fave Exolife from Exogear. Like the Mophie Juice Pack Air and Mili PowerSpring 4 battery packs we already reviewed, the Exolife case promises to "virtually double" the life of your iPhone 4 -- something neither the Mophie nor Mili could quite pull off. Exogear's claim is even more bold given its additional boast about being the "world's thinnest and lightest battery case" for the iPhone 4. Can it possibly compete and knock the Mophie Juice Pack Air out of its title position? Click through to find out. There are two standout specs for the Exolife: size and price. At just 129.5 x 62 x 14.9 mm, it easily bests the 128.8 x 63.8 x 17.2 mm Juice Pack Air and 124 x 65 x 18 mm Mili PowerSpring 4 in terms of thickness and width while coming in just a tad longer. Impressive, considering it packs a Sony-built battery of the same capacity (1530mAh minimum / 1600mAh typical) as its competition. It's also the lightest of the bunch at 2.08 ounces. Of course, a premium price tag typically follows a consumer product that wins the thinnest and lightest category. Exogear's asking price is $89.95. Fortunately, unlike the Mophie Juice Pack Air which is still only available at $79.95 MSRP from Mophie's own onilne store, the Exolife can be purchased for less online (we found Amazon selling it for $72.40). You'll have add another $14.95 to the total if you want the additional clear and gauche blue and green bumpers instead of the transparent smokey grey version handsomely included in the box. Rounding things out is an on/off switch that turns on the extra juice only when required. 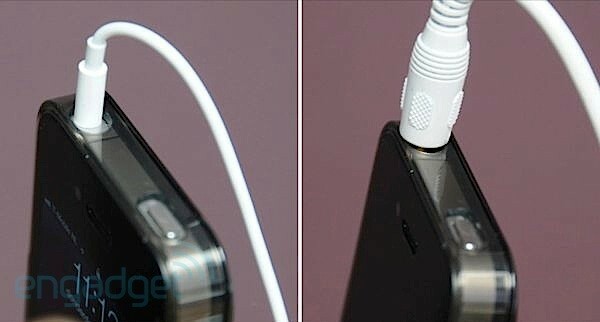 A mini USB jack at the base allows for pass-thru charging and syncing with iTunes, assuming you can remove the stubborn rubber cover. Exogear easily stirs the best first impression with its Exolife packaging. It looks like Apple gear from the outside and things are tight and tidy on the inside once you crack open the plastic shell. A glossy paper mock-up of the iPhone 4 conceals the user manual and sits snugly within the Exolife case to give the purchaser a good idea of how his delicate little bundle of radios will look after purchase. And like the competition, the Exolife ships about three-quarters charged (3 out of 4 LEDs lit on the backside blue battery meter) for use right out of the box. Side-by-side it's hard to tell but the Exolife (center) definitely feels like the least bulky case in day-to-day use. And a slick ploycarbonate hardshell case means that it slides easily into the front pocket. Like the Mophie Juice Pack Air, the Exolife case is a two piece affair. However, instead of integrating part of the side panel into the battery component, Exolife uses a four-sided bumper (very similar to Apple's own bumper) to securely encircle and fasten the iPhone 4 to the battery pack. First, you slide the iPhone 4 into the battery pack's dock connector, then you snap on the bumper in each corner of the rectangle. Don't worry, if you miss a corner (which we did occasionally) the other three will prevent a nasty spill. No, you can't use Exolife's hard plastic bumper as a replacement for Apple's own rubberized Bumpers -- it's too long. As a case the Exolife, like the Mili, won't protect the front-side glass of your iPhone 4 should it drop to the floor. Unlike the more protective Mophie, the side-bumpers just don't rise high enough to protect the display. That's the sacrifice you make when building the world's thinnest iPhone 4 battery case. At least it redirects the bottom-side iPhone 4 speakers front-side just like the Mophie. The Exolife does, however, provide very good access to all the iPhone 4's controls. In fact, you can still access the controls one-handed as you would without the case. Sure, you have a maneuver your fingers a bit to avoid the plastic bumper it can easily be done. That alone could be the decision maker for any of you needing an external battery case on a regular basis. Unfortunately, like the Mili and Mophie before it, the Exolife's headphone-jack cutout might block third-party headphones. In a pinch it's possible to remove the bumper while maintaining charge, however, the case then become very unstable with the iPhone acting as a four and a half inch lever on the Exolife's dock connector -- if you remember your Archimedes then you won't use it this way on a regular basis. Our final, admittedly minor gripe with Exolife design is the gimmicky battery meter. Instead of an instantly visible indicator of battery power left inside the case, a press of the on/off switch causes the blue LEDs to stair step from left to right until all four LEDs are lit. Only then will it display the appropriate bars to indicate the battery pack's current charge level. This take 5 seconds (press and hold for 2 seconds and then 3 seconds to watch the dance). Shutting down the Exolife reverses the light sequence. It's annoying and unnecessary Exogear, so stop it. We had to modify our testing a bit for the Exolife because it doesn't function as a secondary battery where a fully charged iPhone will deplete the Exolife's battery before switching to its internal power source. When the Exolife detects that the iPhone 4's internal battery is fully charged it simply shuts off. Not that we're missing this mode -- even Mophie recommends using its battery case as an external charger (not secondary battery) for best performance. So, using the same approach we took when reviewing the Mili and Mophie, we tested the Exolife with an iPhone 4 drained completely and also 20 percent full (or 80 percent empty, if you prefer). For the empty iPhone 4 battery test, we charged from zero percent to 69 percent in 1 hour and 50 minutes. A second test yielded the exact same result. So again, like the Mophie and Mili, the Exolife provides a ten percent charge for about every 16 minutes the iPhone 4 is connected. We saw similar results when starting with an iPhone 4 with a 20 percent charge. After one hour and 50 minutes the Exolife was spent and the iPhone 4 read 87 percent full (charging 67 percentage points). A repeat of this test brought it to 85 percent (charging 65 percentage points) again after one hour and 50 minutes. These numbers are very similar to the performance we measured for the Mophie and Mili battery cases, albeit slightly less -- the other two cases regularly achieved 69 percent points or better of charge over a period of two hours. Keep in mind, the iPhone was configured for real-world usage during these tests (background push enabled, WiFi on, etc) as it was for the Mili and Mophie tests -- that could partly explain variations in performance. So again, not "virtually double" the life but pretty damn good from a battery case this slim and light. Surprisingly, the Exolife's battery performance was very similar to the Mophie Juice Pack Air even though the Exolife is thinner and lighter than the incumbent. Unfortunately, its smaller size results in a sacrifice of any protection for the iPhone 4's display. That alone could sway some people's purchasing decision. For us, the reduced bulk, superior one-handed access to the iPhone 4's controls, and $72.40 price tag on Amazon (seven bucks and change less than the Mophie) all added up to make the Exogear Exolife our choice for the iPhone 4 battery case champion.